Windows comes with three or more preset built-in default power plans (in earlier Windows operating system known as power schemes). These 3 default power plans are “High Performance” which maximizes system performance and responsiveness, “Power Saver” which saves power by reducing system performance and “Balanced” which achieve a balance between the two by offering full performance during active use and saves power when computer is idle or inactivity state. Whichever power plan you selected to enable, the hard disk drive will be turned off after long period of inactivity or idle. HDD drive in Windows system will be turned off (it’s actually not hibernation as there is no memory state, instead, the whole hard disk is shutdown and cut off from power) in order to conserve and save power or electricity. The downsize and disadvantage of this power saving feature is that when users want to access and read an idle and turned off hard disk drive, the access is not immediate as the drive needs to recover from sleep mode. Usually, users will hear a loud noise generated from sudden start moving of hard disk’s mechanical part, while access to hard disk starts only after a few seconds. Click System and Maintenance or System and Security link. Click on Power Options link. Under the “Preferred plans” or “Plans shown on the battery meter” section, click on Change plan settings link of the power plan selected. Click on Change advanced power settings link at the bottom. Expand the Hard Disk tree branch. Expand the Turn off hard disk after. 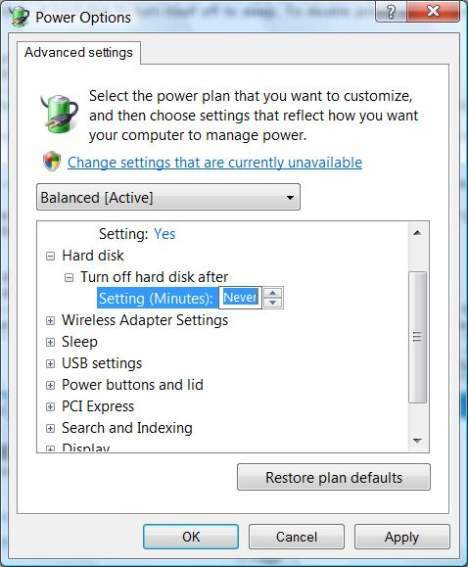 Click on Settings (Minutes) or On battery (Minutes) and Plugged in (for notebook PC), and enter a value in minutes to indicate how long after idling the harddisk will be turned off. To disable turning off or sleep mode, change the value to Never by pressing on “down arrow”. Alternatively, simply enter 0 into the box.